I have to make a confession: I’m in love with this game. Pix’n Love Rush, while being such a simple game, does so many things incredibly right. In its core, it’s an old-school jump ‘n’ run with 3 distinct game modes that will keep you busy for a long time. And all of it is tied together with an incredible art style. 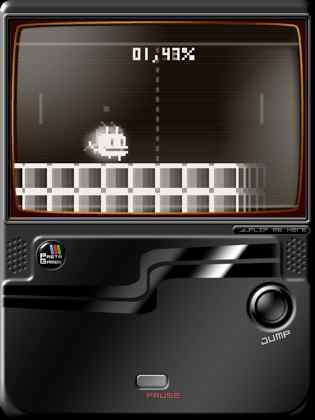 The first game mode is called “Classic Rush” and puts you in full control of Pix’, a cat like character that can run left/right, jump and shoot things. You’ll need those abilities to rush with Pix’ through constantly changing levels where you need to collect positive coins and protect butterflies to earn points and avoid negative coins and shoot bats to keep your points and not lose any of your lives. It sounds simple, but the great level design will definitely keep you on your toes. “Classic Rush” can be played either with a 5 minute time limit or an endless mode that’s only limited by your ability to stay alive. 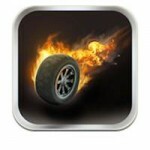 The second mode is “Cursed Rush” in which you only have to do one thing and one thing only: Jump. At the right time that is. While Pix’ is running at a constant pace, you need to make sure that he jumps over all the gaps to arrive safely at the end of each level.There are 5 levels that want to be finished, each more difficult than the previous one. Especially the later stages require you to memorize the levels, otherwise there’s almost no way to successfully make it to the end. 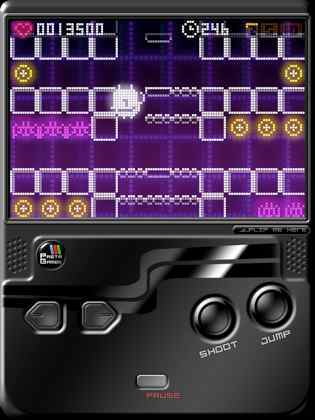 The third mode is “Rainbow Rush” and unfortunately this mode is only available in the iPhone version of Pix’n Love Rush. 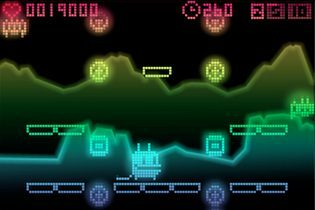 This mode is a variation of “Cursed Rush”, where Pix’ again keeps on running to the right. This time however, you need to make sure that he doesn’t bump into any of the walls. It’s a nice take on the gameplay and definitely a fun mode as well – that’s why it’s really a shame that this update, released over two months ago, didn’t make its way to the iPad version yet. 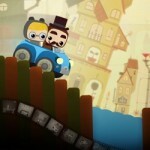 What makes Pix’n Love Rush so outstanding is the level of polish and the incredible presentation. 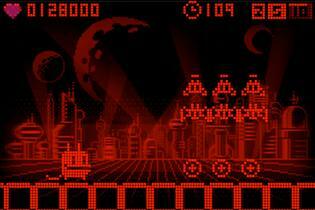 The old-school, always changing pixel art looks stunning and the catchy chip tune soundtrack somehow never gets old. It’s hard to describe, but all the elements in Pix’n Love Rush are so well combined that this game is more than the sum of its parts. The only thing that disappointed me is the outdated iPad version – especially since I really like the way this game is presented on the iPad. If it would have at least been a Universal App, this wouldn’t be that big of a deal, but paying more money for the iPad version that comes with less content feels wrong – no matter how well its presentation is. If you’re into platformers and/or old-school games, do yourself a favor and get Pix’n Love Rush for your iPhone [$0.99] or iPad [$1.99].